What if Sir Arthur Conan Doyle was right all along, and Harry Houdini really DID do his illusions, not through sleight of hand, but via noncorporeal means? More, what if he could do this because...he wasn't human? Ari Ho'd'ni, Glu'g'ik son of the Special Steward of the Royal House of Va'du'sha'ā, better known to modern humans as an alien Gray from the ninth planet of Zeta Reticuli A, fled his homeworld with the rest of his family during a time of impending global civil war. With them, they brought a unique device which, in its absence, ultimately caused the failure of the uprisings and the collapse of the imperial regime. Consequently Va'du'sha'ā has been at peace for more than a century. What is the F'al, and why has a rebel faction sent a special agent to Earth to retrieve it? It falls to the premier team in the Pan-Galactic Law Enforcement and Immigration Administration, Division One -- the Alpha One team, known to their friends as Agents Echo and Omega -- to find out...or die trying. 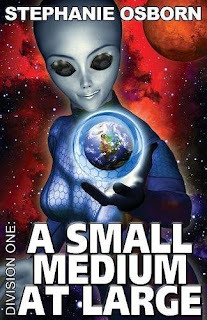 A Small Medium At Large can be purchased at Amazon.com (U.S.) and Amazon.co.uk (UK). Below are links to a few other Houdini science fiction excursions. In addition to his magic gig Darrell's day job is as a graphic artist for a NASA contractor. And the cover art for this book and all in this series is his handiwork. I'm honored that y'all took notice of my little story. I wanted to set it around Halloween, and with my husband's background, I thought that a takeoff on the traditional seance to raise Houdini might be fun. That said, I myself admire Houdini, and tried to handle it -- and him -- in a respectful fashion. The entire series is intended to be fun, action-adventure, and not taken TOO seriously, so please, if it interests you, sit back, relax, and enjoy it!